These measurements are usually printed on the frame, on the inside of the temple or behind the bridge. To measure temple length, you begin at the center of the screw that attaches the temple to the frame front. Follow the length downward and over the bend to the end of the earpiece. (Simply tilt the ruler when you get to the bend and continue to measure). Now you know how sizing works. Let’s figure out what size you need. If your old frames fit well, then others with the same dimensions will fit pretty well too. Sometimes the size isn’t printed on the frame, but the brand and model are. 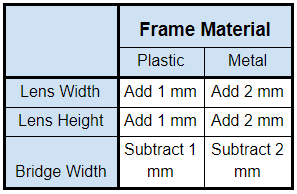 You can use this information to find your frames online. Retailers who carry them will usually list the size. Type this into a search engine and see what you find. Can’t find the size of your current pair? Simply take out a ruler (with millimeters) and measure it yourself. Use the boxing method described above. Glasses sizes are technically for the lenses, not the frames. But the lenses extend invisibly into the frames a little ways. That’s how they are held in place. So, they are a little larger than what you can see. When you are measuring by hand, you have to account for the part of the lens that is invisible. How frustrating! In this case, you will need to estimate your size. Even if your old pair fits badly, they can still be useful as a jumping off point. Put them on and stand in front of a mirror. What would you like to be different about them? Are they too wide? Too tall? Not tall enough? If you can tell how you’d like them to fit differently, then grab a ruler. Visualize where you’d like the frame to sit, and measure the difference. To measure temple length, you begin at the center of the screw that attaches the temple to the frame front. Follow the length downward and over the bend to the end of the earpiece. (Simply tilt the ruler when you get to the bend and continue to measure).